It’s crazy to think that certain words produce certain thoughts. 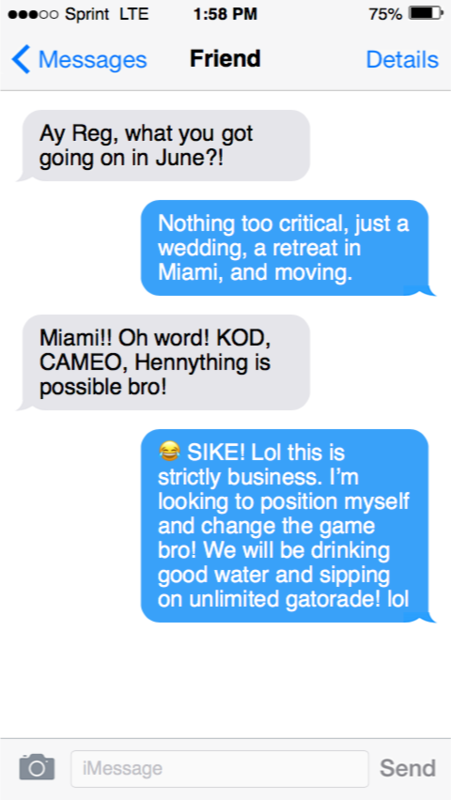 My friend heard the words “Retreat in Miami” and instantly imagined me having the most ratchet time there is. 16 athletes, 6 mentors, 4 days, 1 experience. The Winning Edge Game Changing Retreat name speaks for itself and there is not an event or experience out there that compares. I recently graduated with my Master’s degree in Higher Education Administration and to be honest my initial intention with the retreat was to sweet talk people, making them smil,e so I can get a job. Having applied to over 120 jobs receiving over 50 no’s this was the Chicago in me… finesse and get it by any means necessary. Day 1: Thursday, June 21st. At this point I’m like this dude is real! We get to the hotel, get checked in and I head to the room to meet my roommate Emilio from the University of California, Riverside. I drop my bags off before we head upstairs to fill out some extra paperwork, take our picture and do video interviews. As I’m getting done filling out paperwork I receive a box and a retreat notebook. This is the moment I knew a lot of energy and effort was put into this retreat. The notebook was so detailed having everything the cohort needed to be successful during the retreat. I was thoroughly impressed to say the least! I can assure you that I read that notebook over 15 times during four-day period. While fellow cohort members starting rolling in, I decided to open up the box. Now last time I checked, my birthday was three months ago and Christmas is not for another five months. Clearly, what was in this box was a late birthday gift and early Christmas gift because inside were 2 pairs of shoes, a shirt, polo, golf shorts, a book Living in Your Purpose by Rick Warren, a journal, a water bottle and thank you cards with envelopes already stamped! One word… BLESSINGS. Thank you, Adidas, LinkedIn, and the retreat staff, for showing love and putting that together! After some time my cohort members and I are taken to the retreat house. Big shout out to Mr. and Mrs. Taylor (Maria Taylor’s parents) for showing love and driving us around the entire weekend! Now let me tell you about this house...top shelf... is an understatement! Industrial kitchen, pool, beautiful living room, you name it, the house had it! It even came with a YACHT! SIDE NOTE: Corinne and Maria, we should have called MTV cribs so they could feature us...I can see it now MTV Cribs: Game Changer Edition! Anyways, we are all starving so it's only right that two game changers in the cooking industry bless us. Chef Oscar and Cooper, THANK YOU! The food was a hit from start to finish. After dinner it was time for the first presentation of the retreat from Dr. Colin Williams with RISE (Ross Initiative in Sports for Equality). I must say, Dr. Williams brought the energy and set the tone for the rest of the retreat with his workshop on diversity and inclusive leadership. A quote that will forever stick with me from Dr. Williams is, “ Diversity is being invited to the dance, inclusion is being asked to dance.” #MAJOR KEY ALERT! Everyone screams that they are diverse but the thing that people forget to incorporate is the inclusive piece of the pie. I know I am guilty of focusing heavily on diversity and not applying that same energy into inclusion. During the presentation we did a notecard activity that was interactive and showed the similarities and differences in our cohort which I believe gave birth to us becoming so close in a short period of time. Growth on arrival day, the game changing team is winning already. I’m liking how things are going and cannot wait for the next day! Is there a better way to start your morning off than with a great view looking over Miami while getting your namaste on? Our sunrise yoga session was not your ordinary session… we did TRAP YOGA! Shout out to Troy Benjamin for taking us through this practice and helping wake our body and minds up through different movements. Next on the agenda was breakfast at the retreat house with our mentors: Dell Robinson, Will Baggett, Dr Julie Shaw, Lynda Tealer, and Corinne MIlien (Maria Taylor was on her way after doing her thing at the NBA Draft the night before.) Truthfully, this lineup looks like a Warriors starting five, a team full of All-Stars! It did not matter who is in the game, knowledge was being dropped and wisdom shared! After the delicious breakfast, my mentor and the Executive Associate Athletic Director at the University of Florida, Lynda Tealer spoke to us about the Career Advantages of Being a Student-Athlete. I took a lot away from her presentation, but what was most profound was how student-athletes have an issue with expressing how the skills they develop as a student-athlete can translate to any job. I can raise both hands and feet and say that this is something I struggled with and know for a fact that a vast majority of student-athletes need help with this. We do not have the time to work a job during our collegiate career so we come in at a disadvantage when it comes to practical experience. However, being a student-athlete is an experience in itself that many do not have and it can be used as an advantage to separate ourselves from other candidates. Wise words from Lynda, “Be OPEN” and “Having the will to prepare is a MUST”. Lunch rolled came with good conversation then it was time for session 2 begin. Ole Miss and Baylor alum, Will Baggett, graced us with a presentation on Networking and Professional Presence. In my opinion, this was the session I needed the most and I think some of my cohort members would feel the same. Will dropped so much knowledge on us that it's so hard to pinpoint the most impactful. However, if I had to choose one thing, it would be the importance of eliminating filler words such as “um” and “like”. By becoming aware of this and eliminating those words it helps show that one is competent in what they are saying or speaking on. So ummmmmm, if you like use those filler words you should umm like not use them as often. Make sure you go check out Will’s book: The Blueprint for a Successful Career: A Foundation for Developing Young Professionals. Also check out his podcast with Sean Garcia: The Millennial Leadership Show. Invest in your mental. I promise you, your brain will thank you for the rest of your life! We then had a quick session on Maximizing LinkedIn with a LinkedIn Relationship Manager Mandy Spurgeon which was enlightening. “The only thing people remember is how you made them feel”, words from Whitney Holtzman. Whitney is the Founder of Social Victories and she presented on Digital Branding. The quote she gave us is a main staple when it comes to personal branding. Adding to that, being authentic, organic and giving more than you ask all add to the process of building the best brand pie. We are our own brand and it's easier to promote your true self instead of trying to foster or put on a facade that is not you! So after a morning/afternoon filled with so much knowledge it is now time to get prepared for the moment my fellow cohort members and myself has been ever so anxious for...😎... The Dinner of Influence ! So Emilio and I are back at the hotel getting ready for the dinner putting on our best business casual attire because its game time and we are about to meet some very important people. Side story: As I am getting ready, I get a text from my sister, she asks “hey bro can you talk?”, my response “of course”. Phone rings, I pick up and sis is trying to have a semi-serious conversation, so I’m handling big bro duties while preparing for the game. We head out with about 5 minutes before the vans are supposed to leave. And of course, when we get on the elevator we stop on every floor possible. We finally get off the elevator and I turn the corner to see if the vans are outside...my heart drops...I literally see the vans pulling off and out of the parking lot. Now you are probably thinking, Reg...why didn’t you run after the van…that was a no-go...a brother pants was a little snug so missing the van was one affordable and fixable “L” I could handle but ripping my pants was not and could not happen! I walk outside and saw a taxi and told the taxi driver, “Let’s roll!” Long story short we took a taxi to the retreat house and got there in time without anyone thinking we missed the vans. Big thank you to that taxi driver for getting us there. I owe you one! Hopefully you clicked on the link of what the dinner of influence is (if not click here). When I tell you, I was ready for this moment...I was READY. Before the retreat, I made contact with more than 80% of the dinner guests and did my homework on them especially the ones I wanted to speak with. Alexander Martin, Assistant Director of Student - Athlete Development at the University of Miami, was the first person I spoke with before the dinner and we had conversation as if we knew each other beforehand. Alex is a great guy and provided me with some solid insight on specific situations he has gone through and how he got to where he is today. He introduced me to Charles Nieves, GM of Hurricane Sports Properties and Mrs. Shirelle Jackson, Director of Student-Athlete Development at Miami. Mrs. Jackson if you are reading this, I know we didn’t get a chance to have a conversation but let's connect soon! It was time for everyone to take their seats and I was graced with the presence of my fellow cohort members Jacques and Emilio, my mentor Lynda Tealer, and dinner guests Beth Bass, Alexander Martin, Jenn Strawley, and Tim Wise. The dinner guests were so warm, engaging, personable and down to earth I couldn’t do anything but smile. Normally in “networking” settings people have their ties tied tight and their serious face on. At our table laughs were shared, advice given, and genuine interest in the cohort’s lives was shown. Beth Bass had a quote she shared with us that would probably go viral and shut down twitter, “Know your personal time or someone else will tell you what time it is”. Día numero dos está completo! Time to head to the hotel to count sheep and get ready for day 3! Trap yoga, breakfast. Same flow, different day. The team is a tad bit drowsy but as athletes you know we are bringing energy regardless! First up to bat in today’s line up was the one and only Dr. Julie Shaw. I must say Dr. Shaw is one of a kind, a free spirit, compassionate and driven. Her demeanor is unique and you feel like you can talk to her about anything. She delivered a powerful presentation on Handling Challenges of Breaking the Ceiling. U.N.I.C.O.R.N. - Dr. Shaw gave us this acronym to help us through our journey of breaking the ceiling. Be Uncomfortable, Network, Invite others, Collaborate and Compete, be Organized, Research, and Negotiate. Next up we had a panel discussion on Emerging Careers in Sports that was led by ESPN’s favorite analyst, host and reporter Maria Taylor! The panel comprised of Derek Watford (High Point Gamer), Stephanie Gonzalez (NASCAR), Whitney Holtzman (Social Victories), and Pat O'Connor (Minor League Baseball). We streamed it live on Facebook and these four individuals provided more gems for us to take home. What stood out to me the most was a statement made by Pat O’Conner, the President of Minor Leauge Baseball, “You have to make the first investment”. A lot of people today want someone else to invest in them before they ever invest in themselves or their passions. When you are committed to something you invest in it no matter the cost. Whether it be sleep, money, time, energy, etc. It's all about believing in yourself and investing in you. Oh! I can’t forget to mention the quote of the session “It ain’t bragging if you can do it”. Pat O’Conner was on a roll! After two sessions lunch comes and goes but we are energized and ready to hear what Spellman Johnson’s, Dell Robinson, has to say about professional development and career planning. This was another session that was full of golden nuggets that we all were chomping on! “Take advantage of what’s available and become active in building your brand” - Dell Robinson. This spoke to me because sometimes we try to do what I like to call “force the pop out”. Forcing the pop out is trying to go out and find something to do on the weekend when in reality there is nothing to do. Sometimes the pop out is in front of your face… staying at home and watching Netflix...taking advantage of what’s in front of you. Let me bring it back to the professional side. We try to force the issue with things in finding opportunities, I want this company, in this state, with this pay. Doing whatever we can in our own will to force that perfect situation to occur. When in reality we can save ourselves a lot of trouble by taking advantage of what is in front of us and building off of that. Applying too much force in most situations can break things beyond repair, so be smart and never force the pop out! What’s a retreat full of athletes if there isn’t any athletic type of activity? Tiger Woods is that you in the distance playa?!?! Yea, you guessed it they hooked up the squad with a golfing session at the driving range. Minus the fact that I looked like a melted Kit Kat bar because it was so hot out , I must say I had a blast! Much love to Adidas for the comfortable and fashionable attire, the squad was fresh looking like America’s Next Top Golfers! High key, I think golf will be my new hobby. I thought it was corny at first and only old people played golf but it was definitely relaxing and fun. Unless that means I am old now because I like it…. Fun’s over back to business! Whenever you do anything for a second time you are more confident. So round 2 of the Dinner of Influence was a breeze! Oh, don’t worry Emilio and I made the van this time! Before we sat down and ate with our table host and dinner guests I had an extensive conversation with Trevor Moawad. Trevor is one of a kind and blessed us with a presentation on the last day of the retreat. Maria Taylor, hosted the table with me my cohort members Hope, Arianna and GG. While guests Galen Gordon, Jason Jackson, and Dr. Tywan Martin blessed us with their presence. All I have to say to this is “Another One” *in my DJ Khaled voice*. Another EXCELLENT round table discussion and conversation. The dinner guests provided real life examples of how they overcame adversity and how they broke the ceiling to get into their field of play. For a lack of better terms, it was nothing but REAL TALK going on! And if you know me I’m all about the stats and facts! However, two things stuck out to me. We are human, mistakes will happen, just make sure you right your wrongs and don’t repeat them again. In a digitized world everyone and everything seems flawless and perfect but in reality it isn’t. When you make a mistake don’t wallow in it, get up and make it right! And as a minority in America it is common to be “the only one” so don’t be afraid or discouraged when you are, embrace it. Who would have known blinking four times would make four days go by so fast. While eating breakfast, Trevor Moawad gave a presentation on What you Expect is What you Get and how neutral thinking is more effective than positive thinking. Followed up by Megan Perry, giving us the 411 on the Art of Interviewing. Special thanks to Megan for conducting mock interviews with us before the retreat and providing feedback that we can take home and use to perfect our skills. And last but certainly not least THE Maria Taylor spoke to us on Coping with Success & Failure. Don’t short change yourself, bet on yourself, every time. If you don’t take a chance or bet on yourself then why would anyone else? Thank you Maria for that. At times when the goal is lofty or we hear “they” downplaying the vision and dream, our doubt creeps and we begin to question it. Don’t. Take a chance on yourself regardless of what it is. My mother told me this “Nothing beats a failure but a try”. So just do it! In the midst of all this, the team and I along with the videography crew crafted up a quick video saying thank you to the two women who had the vision and created this opportunity, Corinne and Maria! Then shortly thereafter the tear jerking video, Corinne asked us to come up and speak. I’m thinking cool I can do that, say my peace and have a seat. So it was my time to speak. I start talking and all of a sudden I feel a rush of emotion. We are NOT doing this right now Reg. As I speak to myself in my head. I verbalize a classic Lil Wayne verse “Sometimes I wanna drop a tear but no emotions from a King!” . For the record I did not cry, I held it solid. I haven’t cried since 1992, so that was not the day to start! But in all seriousness emotions were running heavy. We traded in our distinction as cohort members to family members. We all grew so close in a short amount of time, we all were shocked that it happened but all felt the same way. This entire retreat, top to bottom, start to finish was 1st class. It was such a blessing and refreshing experience to see people that look like me and who were not only like-minded but were smarter than me and doing what I envisioned and dreamed of doing. Seeing in living color was powerful. Jarrod Barnes of Prime U, Coach Thomas Brown Offensive Coordinator at the University of Miami... Dr. Eric Wood Deputy Athletic Director for Competitive Excellence... Jennifer Heistand of Still Point Performance... Future Neurosurgeon Myron Rolle... and Danisha Rolle, Founder of Sports & Entertainment Today. Thank you for the conversation and wisdom! Also thank you to all the dinner guest for coming out and investing in the future. To the Southeast Missouri State University Department of Educational Leadership and Counseling & Graduate School for funding my travel. And to my Academic Support Center family, thank you for the continued support! To my 16 new family members, I love y'all. To my 6 new mentors, I love y'all. To the entire retreat staff, I love y'all. The standard has set and the game has been changed!